Learning about low glycemic index foods is very important, especially if you have problems keeping your blood sugar at a consistent, balanced level. Particularly those with diabetes, high blood pressure and pcos will find great benefits of eating mainly from the list of low glycemic foods. The reason for this is that foods with a low glycemic index will not causing their blood sugar to rise explosively only just to take a steep fall shortly after – leaving them tired and craving for more fast carbs to get the blood sugar rising once again. This reaction is known as the ‘glycemic response’, and all foods are converted to glucose differently by your body. Glucose in its natural form has a GI value of 100, and it is used as the reference point to rank all the other foods. 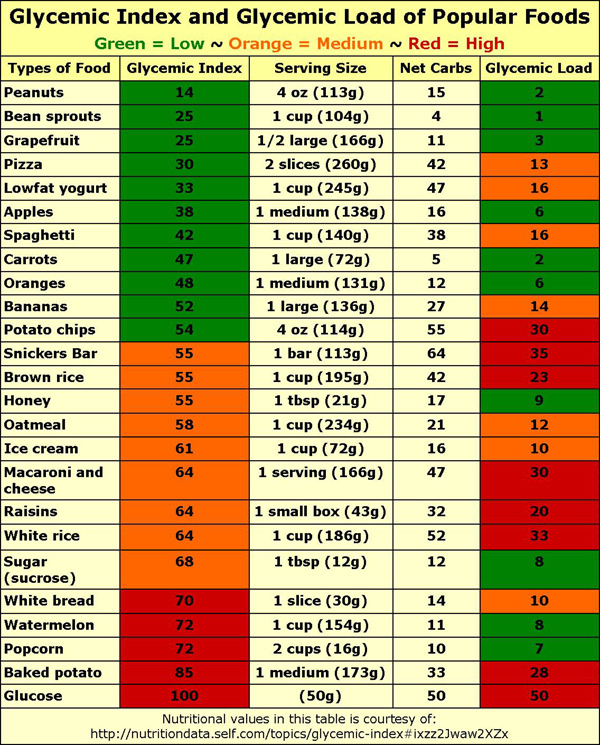 The Glycemic Index is actually a very interesting list of foods. In my experience many of the foods that you think would be low on the list of low glycemic foods are actually ranked highly, while the low glycemic carbs, low glycemic fruits, and low glycemic vegetables that you’d imagine to have a lot of sugar will actually be ranked fairly low on the GI list. You have to study the Glycemic Index in order to know how all of the various foods affect your body, so it’s in your best interest to take the time to read it carefully. All of the foods that are ranked on the Glycemic Index have been given their value to let you know how much they affect your body, and they do so by increasing the amount of blood sugar in your system. Your body always works best when the level of blood sugar stays fairly consistent, as that’s the way it was designed to run. The results of low blood sugar is lethargy and hunger pangs, and the result of high blood sugar is excess insulin production. However, there is a risk that your body will produce too much insulin when your blood sugar gets too high, and this will cause a drastic lowering of your blood sugar. It may actually be too far lowered, and your body will go into a sort of reverse pendulum swing when your blood sugar dips too low after being too high. This is why you’ll often feel so tired and lethargic after eating foods with lots of sugar, though initially you’ll often feel elated, on a high, and with a very elevated mood. Things get even more problematic if diabetes is thrown into the mix, as those with diabetes are unable to produce enough insulin to lower their blood sugar levels. Some high glycemic foods are very good for your health, but they will affect your blood sugar more than you would like. You’ll be able to identify which the problem foods are, and you’ll be able to cut down on those or avoid them to prevent your blood sugar levels to rise too high. Before you freak out about all of the foods you can’t eat, you need to understand the concept of the glycemic load. You know that foods that are high on the glycemic index will be the ones that will cause your blood sugar to rise. However, not all of the foods high on the list are high in sugar, and some of them will contain no sugar but lots of starch. This is because the glycemic load determines how much the food will affect your body. Let’s say you’re eating 4 ounces of peanuts. The Glycemic Index gives peanuts a value of 14, so divide that number by 100 for a total of .14. Multiply that by 15 – the number of net carbs you get from that amount of peanuts – and you get 2.1. This means that for every 4 ounces of peanuts, there is a glycemic load of 2. The Glycemic Load not only takes into account how fast the carbs enter your system, it also tells you how many carbs the food actually contains. So the Glycemic Load isn’t the same as the Glycemic Index ranking, and you need to understand how much the values of these two foods are. If the Glycemic Load is higher than 20, it’s considered a high GL food. If the ranking is lower than 10, it’s considered a low GL food. If the Glycemic Index ranking is higher than 70, it’s considered a high GI food. If the ranking is lower than 55, it’s considered a low GI food. The goal is to find foods that are both low GI and low GL, as that will ensure that you are eating the right foods for your health. The Low Carb Diet is a diet plan that has been recommended by many doctors, and the purpose of the diet is to help keep the blood sugar stable. The diet is often followed by those with diabetes and other blood sugar-related problems such as pcos and insulin resistance, and it can be an effective one. However, there is a difference between the low carb diet and the low glycemic diet: the low carb diet is restricting the amount of carbohydrates overall. The low glycemic diet is not limiting the amount of carbs as such but is restricting the intake of ‘fast’ carbs, meaning those with a high glycemic index. Both diets are considered to be effective, but there can be pitfalls so like with everything else, it’s a question of balance and using your common sense. The foods that are lowest in carbs are the ones that contain the most fat, such as meat, chicken, and dairy products. These foods will contain almost no carbs, but they will contain far more cholesterol and saturated fat than you should be eating. Going for too much meat and dairy may mean that your body is going to have a lot of saturated fat floating around it, and the risk of cardiac problems will rise. So when choosing your fats prioritize the unsaturated versions found in e.g. olive oil, nuts and avocados. If you look at the list of low glycemic index foods, you’ll find quite a few fruits (e.g. banana, grapes, and melons) high up on the glycemic index scale. However, even these fruits high in GI are also high in nutrient content. This is because many of the foods that will have a greater effect on your blood sugar are foods that have the highest levels of nutrients, but if you just forsake them, you’ll miss out on important beneficial vitamins. So make sure you get a rich, varied diet not leaving important food sources completely out of the picture. Hypoglycemia is a condition that may set in when your blood sugar is very low, and it may be a health risk when you’re following a low carb diet. The foods that you’re eating are all low in sugar, so your blood sugar will not be affected as much by the food you eat. This may increase your risk of your blood sugar levels dropping, and you may find that your body will react the same way it would if you were not getting enough glucose – feeling tired and lethargic. Done too strictly a low carb diet is very restrictive, as there are only a limited number of foods that you can eat that don’t contain a lot of sugar or that won’t have an impact on your blood sugar. This may means that you’re likely to get very bored, and you’ll end up craving foods that will actually be bad for your health. This is something that all those on the low carb diet have to fight, and it can cause you to cheat on the low carb diet – affecting your blood sugar dramatically. As the low carb diet is characterized by eating more protein than normally, you may find it challenging to do both types of diets at the same time. However, wherever there is a will there is a way, and nuts plus some of the high protein veggies (like beans) are also good low glycemic foods. For those living a low carb lifestyle, the cost of special foods will be most likely be higher than otherwise. You’ll have to spend a lot more on the proteins and you can find the low carb alternatives to white wheat flour, white noodles, white bread tend to cost a lot more than the regular foods. You’ll end up spending a lot more on food, and it can be hard to afford a low carb lifestyle. The truth is that following a low carb diet or low glycemic diet is recommended for those who have diabetes and other health problems, but those that are trying to lose weight and stay healthy would do well to just reduce their consumption of foods that have a high Glycemic Load. The higher the GL, the more effect the foods will have on your body. If you’re following a healthy lifestyle and eating the right low GL foods, you shouldn’t have to worry about your blood sugar too much!